The millionaire industrialist and philanthropist Andrew Carnegie represented the conflicting roles played by the late nineteenth-century's "captains of industry." One of the era's most generous philanthropists, Carnegie's Gospel of Wealth held that the rich had a duty to contribute to the welfare of society; he accordingly set up a trust fund that led to the creation of over 3,000 libraries and other institutions. On the other hand, his Carnegie Steel Company also lowered wages to increase profit, as it did in 1892, resulting in a strike and subsequent violence after the company employed strikebreakers. Source | "Forty-Millionaire Carnegie in his Great Double Role," The Saturday Globe, 9 July 1892; from David P. Demarest, ed. "The River Ran Red": Homestead 1892 (Pittsburgh: University of Pittsburgh Press, 1992), 189. 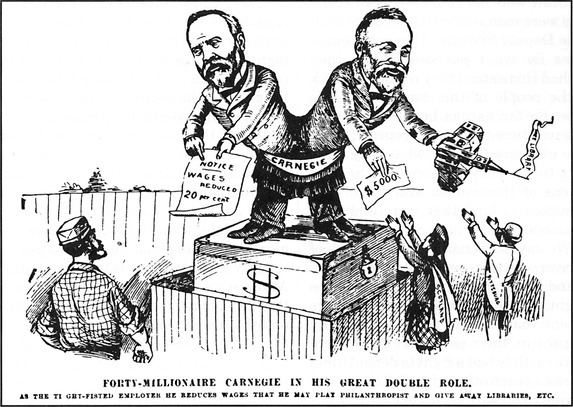 Cite This document | Unknown, “Andrew Carnegie Plays a Double Role,” HERB: Resources for Teachers, accessed April 21, 2019, https://herb.ashp.cuny.edu/items/show/636.